In 1932 a board was found in a crannog (lake dwelling) in Ballinderry, Ireland. It contained a 7 X 7 grid of holes, and was decorated with designs used in the 10th century. Many scholars believed it to be a Fidchell (Fithcheal, or Fitchneal) or "Brandubh" game mentioned in early Irish legends, and related to Scandinavian Tafl games. These were the games of choice in Northern Europe prior to the introduction of Chess. The defenders win if the king escapes to the edge of the board, and the attackers win by surrounding the king. We include 4 different game variations included in the rules. The set also includes a simulated sheep knucklebone for use as dice for a Welsh variation. The knotwork decoration is our own interpretation of the carving on the Ballinderry Game Board. To our knowledge we are the only company to produce a game board directly based on the Ballinderry games artifact. Excerpted from our article "Lost Celtic Games" published in the Renaissance Magazine in 2001. Although rules specific to Fidchell have never been found, most scholars agree that the Ballinderry artifact is most likely a variation on a Viking "Tafl," or "Hnefatafl game." These games were played by Norse cultures as early as 400 A.D., and seem to have been the primary strategy games in Northern Europe until the introduction of Chess. 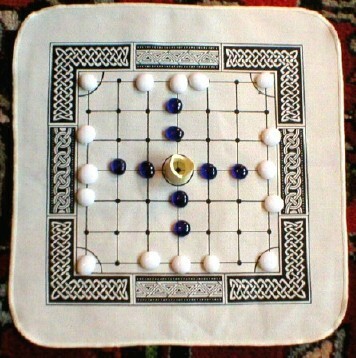 Examples of these game boards have been found with grids varying from 7, 9, 11, or even 19 spaces on a side. The rules for Tafl games have come to us from a pair sources. A game called Tablut was recorded in the diary of Swedish botanist Linnaeus in 1732. He found the game being played by Alpine Lapplanders, and recorded the set-up and a description of the rules. An even earlier description of Hnefatafl survives in an English manuscript from the reign of King Athelstan (A.D. 925-40). It includes a diagram of a board, the starting positions on a 19 X 19 grid and at least partial rules for the game. 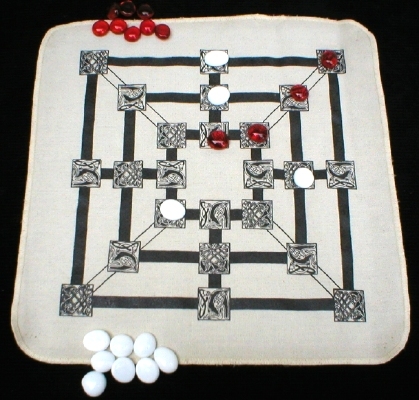 Unlike Chess, or Checkers which are fought by armies from opposite sides of the board, Tafl games involve a single king and his defenders in the center of the board surrounded by an army of attackers twice their number. The basic rules are that the defender starts with the king in the very center of the board and defended by his pawns, or guards. The defender wins if the king is able to break the siege by escaping to the edge of the board (or to a corner hole in some variations). The attacking army wins by surrounding the king on four sides to capture him. All of the pieces move any number of spaces left, or right, or up, or down, in the same manner as a rook in Chess. "Pawns" may be captured by trapping them between two of your own pieces. This information is provided as a service, feel free to use it for educational purposes.